In any start/end date field you can choose to type in the date you want using the dd/mm/yyyy format. 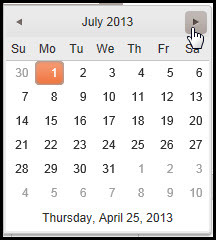 You can also choose to use the calendar icon to scroll through months and years to locate the date you want to use. Click on the icon, and a calendar pop-up will appear. If the date field is empty, the calendar will start with the current month and year. If the date field is not empty, the calendar will start with the month and year matching the date displayed in the field. 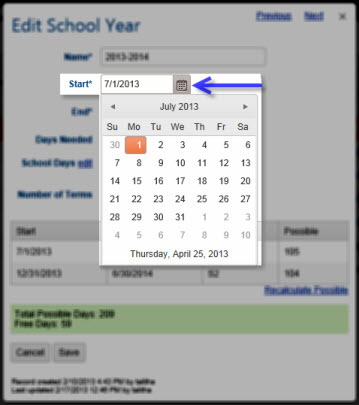 When viewing the monthly calendar, click on any date to enter that value in the date field. Use the left and right arrow buttons to move backward or forward in time to find the month needed. Sometimes it will be a bit tedious to move one month at a time through the calendar to get to the date you need. Again, you can simply type in the date you want using the dd/mm/yyyy format. Or, you can click on the Month/Year heading in the calendar and that heading will change to show just the Year, with the months of the year displayed below. 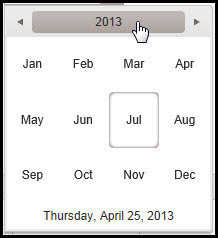 In this view, you can use the left and right arrows to move backward or forward in time by years, and then select the month you need in that year, and finally click on the date to fill the date field. 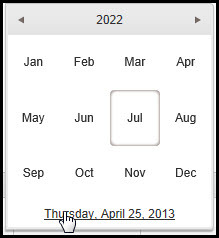 At the bottom of any view of the calendar, the current day and date will be displayed. Click on Today's date to enter that value into the date field.